Who better to review and advise executive directors of ILCs of best business practices than other directors in ILCs? This Peer Review focuses primarily on business practices, although it does touch on the standards and indicators to assist Centers in addressing the full scope of what quality looks like in Independent Living Centers. 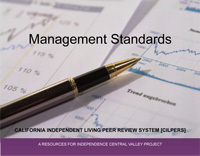 Executive Directors of Centers who wish to participate voluntarily may act as peer reviewer(s), and be reviewed by peer Executive Directors in the Independent Living community in California, after completing required training. The purpose of this review is to assist the Executive Director in evaluating areas of strength and areas where improvement is needed, and to advise the Executive Director of this information. This process ensures that any feedback, as well as the responsibility for addressing areas of concern, belongs to the Executive Director to share or not share as s/he deems appropriate. The review is conducted in a voluntary, safe and confidential manner, the reviewed center remains in control of the information gathered and the report generated by the review. There are five Executive Directors that have undergone training, a team of two will conduct the review process and handle any questions, concerns about the process as it unfolds. What organizations are eligible to apply? Any California Independent Living Center can apply to have a peer review performed. A Center of Excellence is an ILC that has gone through a Peer Review and has completed the recommended Management Standards. 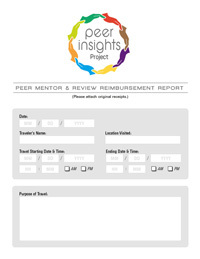 How do I schedule a Peer Review? 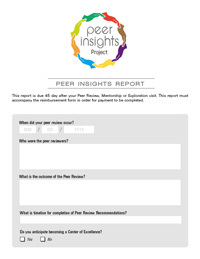 Peer Review applications are approved on a first come first serve basis, apply today! We are no longer accepting Peer Review applications, at this time. Please call CFILC at 916-325-1690 / 916-325-1695 TTY with any further questions.